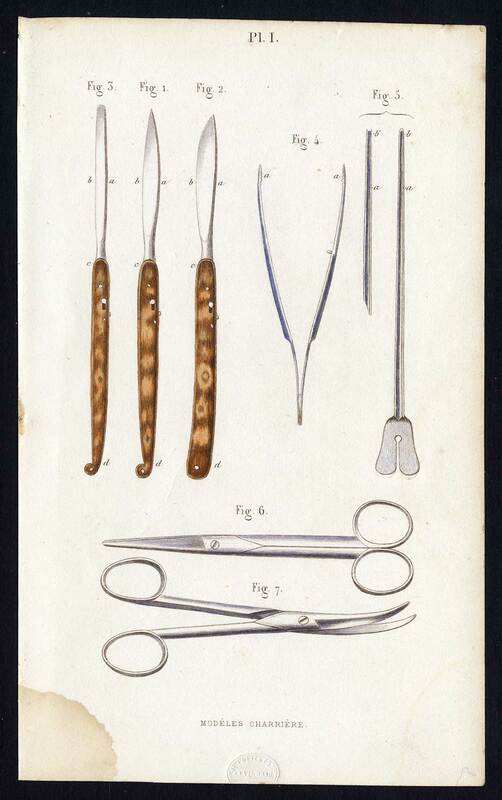 Subject: Plate I: This plate shows surgical instruments for making incisions; scalpels, tweezer, scissors etc. Copy of descriptive text available. Condition: Good. General age-related toning. Damp stain bottom left, not affecting image. Please study scan carefully. Size (in cm): The overall size is ca. 10 x 16.5 cm. The image size is ca. 7.5 x 15 cm. Size (in inch): The overall size is ca. 3.9 x 6.5 inch. The image size is ca. 3 x 5.9 inch.